Over 40 fun items to find and collect at the Mall! And the best part about this fun game / activity for sleepovers, birthday parties, or group events is all of the items are free and available at most shopping malls. 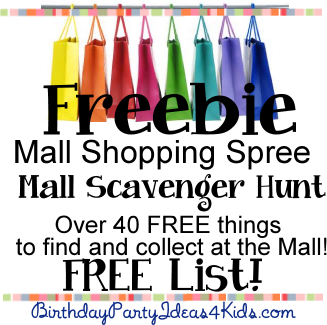 The Freebie Mall Shopping Spree is a fun Mall Scavenger Hunt which is a great party activity for kids, tweens and teens. 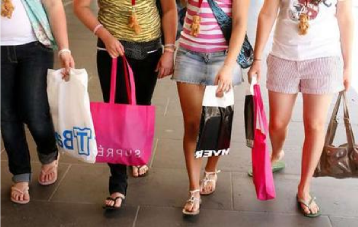 The list includes 44 free things to find at your local mall. 5 points for each item teams bring back. No 2 items from the same store. 10 point bonus for first team to arrive at the meeting place. 10 point deduction for every instance of running, screaming or being rude. 1 point deduction for every minute teams are late to the meeting place. 18. Blue eye shadow - 3 point bonus if each team member is wears it. 30. Store display - 10 point bonus for the team with the largest one.